After DIY home improvement projects and remodelling your house, apartment or office, you will most certainly end up with a lot of renovation waste. Now, it is time to dispose of it properly and responsibly. You can donate some of the items, you can take others to your local landfill or hire a professional junk removal service in Berrylands KT5 that will take care of it. If you are not sure how to do it, here are few ways you can dispose of your renovation waste efficiently. Plus, it won’t cost you a lot of money. All items you want to donate should be reusable and in a good condition. Make sure you keep them clean. After a home improvement, you will have items and waste that cannot be reused or donated. One of the ways to get rid of it and dispose of it properly is to take it to a dump. You will need to load all your renovation waste to your truck and take it to your local dump or landfill. This is a cost-effective solution that will enable you to get rid of your waste responsibly. Before you opt for this solution, it is recommended that you contact your local dump and get all necessary information about how you can properly dispose of your unwanted waste. You will probably need to separate all of your materials beforehand because there are usually sections for different types of waste. Your local garbage collection service can help you with the disposal of your renovation waste. Contact them, tell them about what kind of waste you want to dispose of. This service won’t cost much and you will feel relaxed knowing that your waste will not pose a threat to human health and the environment. As mentioned above, some items can be recycled directly into the same product for re-use. Others are reconstituted into other products. Contact your local recycling centre and they will provide you with guidance on how to classify and separate materials for recycling and other relevant information for your renovation waste recycling. 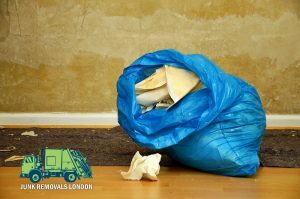 Form small-scale home improvement waste to a big construction company’s waste, hiring junk removal services in Selhurst SE25 is a fast and budget-friendly way to dispose of renovation waste. All you need to do is contact them and they will ensure that all the waste is disposed of in an environmentally friendly manner. Make sure you research the company well before you hire it. Only then will you enjoy top-notch builders waste clearance service in London. Also, don’t forget to compare quotes in order to choose the most budget-friendly option out there.